In my opinion the Backbeats series is fantastic. They originally sold at around £3-£4 and you could have picked up these CDs blindly. 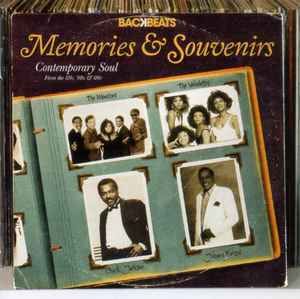 However, do yourself a favour and check out some soundclips first before you buy "Memories and Souvenirs"
The promotional text "featuring music compiled from the archives of Columbia, Epic, Okeh, Philadelphia International, Buddah, RCA, Arista, Wand, Scepter, Musicor, Date, King, Dynamo, Look, Despenza, Garrison, Hollywood, Kudu, CTI, Ariola, Motor City, Invictus, Hot Wax, Music Merchant and Hi" refers to the Backbeats series and NOT this particular compilation. This is a compilation ONLY of tracks from Ian Levine's Motorcity label. The Motorcity sound features good to great Soul vocalists with weak to nasty backing tracks dominated by drum programming and synthesisers which haven't aged well in the decades since (most) of them were recorded. I am not even going to say that after more than 50 compilations it was just a matter of time before one would slip through Ian Dewhirst's Quality Control. For me this one is the turd within the Backbeats series.